This is the fastest single GPU card around, offering performance only before seen in monstrously power hungry dual-GPU cards, but now in an elegant, efficient package. Nvidia has maxed out its Maxwell graphics architecture and this is the result: the Nvidia GeForce GTX Titan X. The most powerful consumer GPU we've ever seen. Brilliant. That means, once again, we can trot out the familiar "fastest graphics card ever" headline, right? Well… no. There's actually a bit of a distinction between the fastest single GPU and the fastest graphics card – the two do not necessarily mean the same thing. But we'll come to that in a bit. What we do have here though is a brand new "ultra enthusiast," super-expensive, $999 graphics card. Think Intel Core i7-5960X Extreme Edition CPU, Apple Watch Edition or Audi R8 and you'll be on the right path. But where the Audi really needs a race track to show its full worth, the Apple Watch Edition needs a millionaire who doesn't get out much, and the 5960X can't shine without rare complex number-crunching algorithms, the Titan X will deliver impressive gaming performance at almost any level. Like all the other Titan cards Nvidia has released over the last three years, this is a card for gamers who want the best gaming experience possible and don't mind paying for it. But it's also a card designed to be an object of desire. This is an aspirational piece of hardware, likely to be much wanted but less purchased by the average PC gamer. 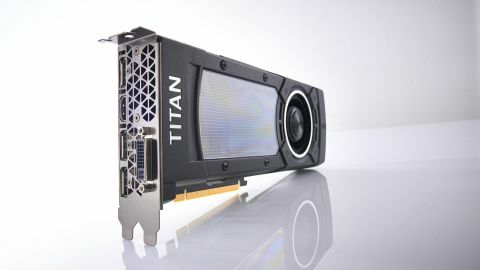 The Nvidia GeForce GTX Titan X is a headline-grabber, a card built to showcase the Maxwell GPU tech and hopefully convince the more money-conscious to spend their GPU upgrade cash on one of the more affordable Maxwell-powered graphics cards. The trickle-down effect is real here, because the GTX Titan X is using the same overall GPU design. However, it's also throwing many more cores and a lot more memory at the gaming problem to deliver seriously impressive frame rates. And the target for those metrics? Nvidia has 4K gaming at peak settings firmly in its sights for the GeForce GTX Titan X. And, for the most part, this card is very accomplished at delivering on that lofty ambition.